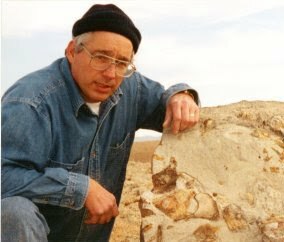 Recently, Ken Ham and his ministry, Answers in Genesis, have begun touting a new model of "adaptation" in order to accommodate both the chronology of Flood Geology, and get themselves out of the impossibility of the Ark, as described in Genesis, housing tens of thousands, or even millions, of pairs of animals. (6,199 amphibians, 9,956 birds, 30,000 fish, 5,416 mammals and 8,240 reptiles) [ The International Union for Conservation of Nature and Natural Resources (IUCN) 2007 Red List.]. Even disallowing the fish, which the Creationists usually claim would all have survived the Flood outside the Ark, an impossibility give the intolerance to salt of nearly all freshwater fish, we have some 30,000 pairs of animals, 60,000 in total (ignoring the useful animals, mostly large mammals, of which Noah was instructed to take 7 of each "kind". So most Creationists have abandoned the biological species as being the meaning of "kind". Now, AiG and Ham have decided that a "kind" is (usually) equivalent to a family in the Linnaean hierarchy. AiG lecturer Bryan Osborne presented a graphic where he uses this definition of "kind" to graphically illustrate how all the living diversity of life developed by rapid migration and adaptation from a single pair of each "kind". As an example, he and Aig use Hesperocyon gregarius, a fossil species of canid dating back to the Mid-Eocene 42.5 mya—31.0 Ma. as the basal dog kind from which descended all the known species of wolves, coyotes, jackals, foxes, etc. comprising 13 distinct genera and at least 31 distinct species. This of course ignores all the extinct descendants of Hesperocyon, in a total of three subfamilies. [Source: Wang, 1994; Tedford, Tayor and Wang, 1995; Wang, Tedford and Taylor 1999; Tedford, Wang and Taylor 2009]. The adaptive radiation of the initial pair of Post-Flood Hesperocyonids, according to AiG, took place in less than 4,000 years, and as others have documented using Biblical timelines favored by the Creationists, probably less than 2,000 years. This is a rate of evolution never observed in nature; in fact it is at least three orders of magnitude higher than anything previously documented. It certainly constitutes macroevolution as defined by evolutionary biologists, and often by Creationists as well, since new species, new genera and new subfamiles resulted. I have taken the graphic prepared by Bryan Osborne and updated it by doing two things. First, I have followed AiG's suggestion that "kind" generally is equivalent to a Linnaean family, and have added the most adequately described and securely dated species known for that family. Identifying the family was easy in the case of the "dog kind", but in other instances I've had to guess at what family was intended. In the case of the bird, it is safe to conclude from the silhouette that it is one of the perching birds, the Passeriformes. I've taken the liberty of choosing Darwin's finches as the birds intended, the family Fringillidae. The dinosaur is clearly a Triceratops, so I have used the family Ceratopsia. For the frog I chose the most familiar and widespread of the modern families, the water frogs, Ranidae. For the lizards I chose the primitive geckos, family Gekkonidae. I also corrected AiG and Ham's use of Hesperocyon gregarius as the basal canid, when in fact it is Prohesperocyon wilsoni. 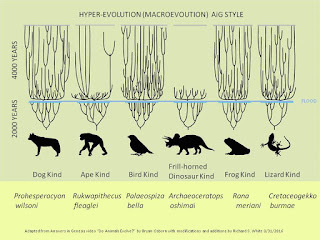 Second, I have added a time duration of the two phases of Hyper-Evolution, lest we forget that an equivalent amount of diversity developed prior to the flood, and in half the time. So what are the points I'm trying to make here? 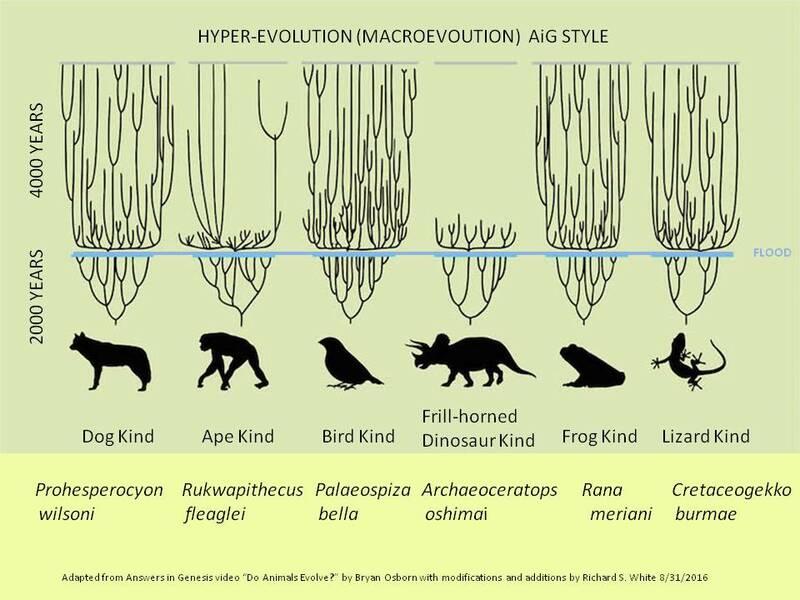 The first is that by re-defining "kind" to be a biological family, AiG/Ham are able to accommodate their extreme Hyper-Evolution, which is certainly macroevolution as it has been traditionally defined by evolutionary biologists, in the unbelievably short period of time after the Noachian Flood. The second point is that the Ark, as traditionally depicted now is impossible. No elephants, giraffe, zebra or any other recognizable animals. Instead, the Ark must have been filled with the basal member of each extant family, none of which would be recognizable to us today. The third point is that the AiG/Ham model conveniently leaves out all of the extinct animals which today have no living representatives. Once again the Ark flounders and sinks under the weight of animals, dung, and necessary food for the year-long voyage. They haven't saved the Ark. And not only have they failed to save it, they've had to admit the existence of rapid hyper-evolution above the species level in the last 4000 years.